Birth stories are fascinating. One of the wonders of the information age is how easily and widely women can share their stories. Each one is as unique as the child being born. My 5 births are all different, each with a different level of management. It’s quite some variety: medically-necessary induction, low-risk with an epidural, unintentional and intentional natural birth, and a stalled birth–all in the hospital. The Ballerina’s birth was my first. I had no idea what to expect. I didn’t even know what resources to look for. I was 28 when I became pregnant with the Ballerina. I wasn’t classified as a high-risk pregnancy. My weight-gain was in the healthy range, my blood pressure stayed pretty good throughout, and though I was tired, I didn’t seem to be excessively so. After all, I was pregnant and teaching junior high full-time. That meant being on my feet for five or six hours of the day, and it isn’t what I would call a low-stress environment (particularly in that district). During the fourth and fifth month of pregnancy, I developed severe pain in my lower back and down one leg. Assuming it was sciatica, Dr. K sent me to physical therapy, which made it worse. After six weeks of constant pain, which was only bearable when I was standing straight or laying flat, I went to the chiropractor. After one adjustment, my pain was down by about 90%. I could drive across town without crying from the pain. A second adjustment eliminated it completely. I loved Dr. K. I felt much more comfortable with a female doctor than a male, and she was easy to talk with. She never made me feel silly or stupid for asking questions. Two of her staff attended our church, so I got several casual “check-ups” every Sunday. Still, I can’t say I was a well-educated mom about birth. The one birth class offered in town didn’t mention anything about naturally handling labor pain. They did a very good job talking about real vs. false labor and explaining the different pain-relieving options available. They took us on an excellent tour of the maternity floor of our hospital and guided us all through pre-registration (I love pre-registration). One of the nurses teaching the class was a La Leche League leader, and the information on breastfeeding was also great. I really could have used information about relaxing through contractions, breathing to ease the tension, and the power of visualization throughout. I went into labor completely unprepared. And that was that. I did not get to go home to pack my bags. I had to call a neighbor to pick up my step-daughter from the hospital. Neither my husband nor I had cell phones, and I was unable to get anyone at my husband’s workplace to pick-up the phone. He arrive home three hours later to an empty house, a very hungry dog, and my message on the answering machine. My sub-plans for work weren’t done, and I hadn’t planned anything for that week. I was expecting to go closer to my due date (as first-time moms are so often told they they may go overterm) and had started plans with that in mind. I called a teacher on my team and gave her emergency plans for the week over the phone. I hadn’t discussed much in the way of a birth plan with Dr. K. I hadn’t even heard about birth plans then. I did know that I wanted to avoid a c-section. Being cut open scared the heck out of me, and I knew if I had one, the chances of having another were high. I wanted a big family, and I didn’t want to have to cut it short because my uterus couldn’t handle another surgical birth. Thankfully, Dr. K agreed with me completely. She had no desire to cut me open either. I spent the night laying awake, staring at the BP monitor, willing my pressure to go down. It didn’t. They had put a medical goo on my cervix to soften it–I wasn’t dilated at all, nor effaced. 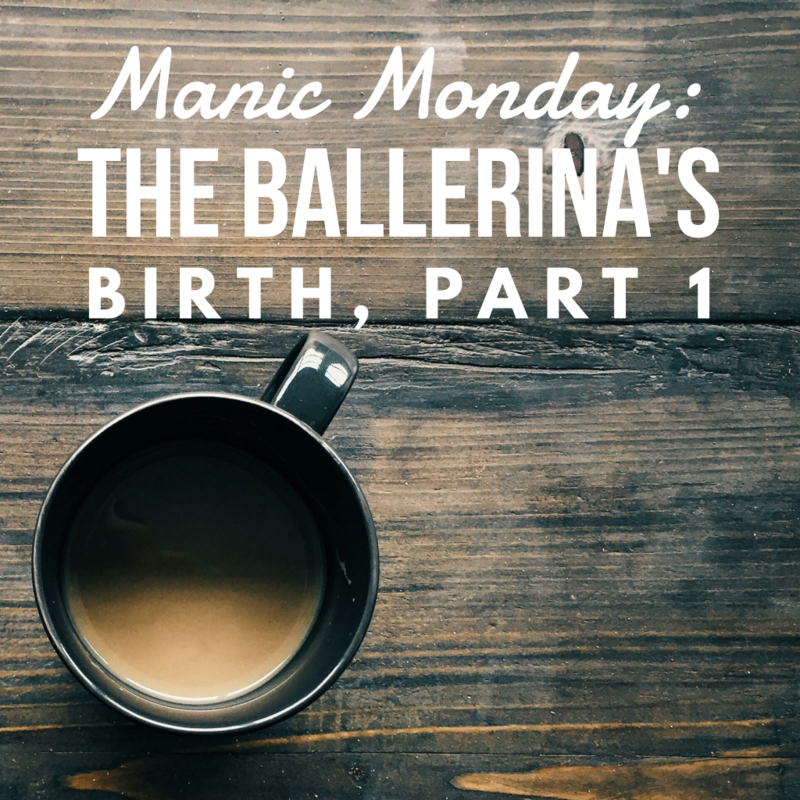 The Ballerina wasn’t ready to be born, and my body wasn’t ripe to birth her, but we didn’t have a choice. By morning, my BP had crept up. They induced me at 8:00 am. No one had told me that induced contractions are harder and more painful that natural ones. I’d had no information about how to handle contractions at all. I could not receive an epidural until I had reached a certain point of dilation (5, I think). Until then, we needed labor to progress if we wanted to avoid a c-section. So we progressed in intense, terrible pain. I walked. I got on all fours. I leaned on my husband. I held his hand. I had him rub my back. I think I even tried a shower (after a while, it’s just one blurry memory of pain). These things might have worked well, except that I was missing a very key part of riding out contractions: I was not relaxing my uterus. So long as I kept tensing in reaction to the pain, the pain would be worse (and I would be more tense). I don’t know how long it was before I was able to receive the epidural–it had to have been at least 4 hours, but it felt much, much longer. I know I dozed some after it took effect. I hadn’t slept much at all the night before, and the nap at lunch the day before was long in the past. At least I continued progressing and soon I was fully dilated and effaced and it was time to push. The epidural was wearing off a little by then, just enough to sort of feel to push and sort of feel her being born. I’d always heard stories about women pushing for hours and hours, so when I was told it was time to push, I thought I was only half-way through. I thought I had hours more of work ahead. The Ballerina took four, maybe five pushes, about twenty minutes worth (um, don’t hate me), with rests in-between, and she was born at 1:20 pm. Daddy finally meets the little girl he waited so long for. She was tiny, 5 lbs., 2 oz., only 17″ long, a tiny fairy child with sticks for arms and legs. She’d had no time to put on the last layer of fat some babies develop. Thick, black hair covered her head and she looked like an angry beet with a brush-cut. I fell so deeply in love with her. It was like I’d never understood love before that moment. 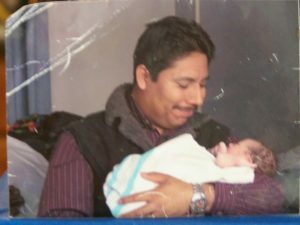 I wanted to hold her and never let her go, and they let me as I delivered the placenta and they cleaned me up. A few stitches for a few minor tears, a few minutes to let the nurses finally weigh and measure and diaper her, and she was back in my arms. Everyone stepped out into the hall to give mother and baby a few minutes of blessed peace and quiet to meet each other. Which would have been fine, except something–maybe the epidural, maybe the stress, maybe the medication they had given me to help me sleep the night before (which didn’t work)–made me suddenly nauseous. I couldn’t figure out how to hold the Ballerina safely and reach the call button, and I had this horrible image of me throwing up on my beautiful newborn baby girl, who had surely had as hard a day as I. I leaned as far over the edge of the bed as I dared, and I vomited all over the floor. After being moved to a clean room, I thought the hard part was over. My baby was here. She had already latched on and breastfed. My brother and his family were there, and my parents came in, it was joyous and beautiful. I felt like a wrung-out washcloth, but isn’t that how a woman feels after birth? The worst of it was over . . . I thought. Previous Post Supplementing with Sulfur? Oh Yes!